There are many reasons why mowing wet grass is a bad idea, and it's not only heavy rainstorms that pose a problem. 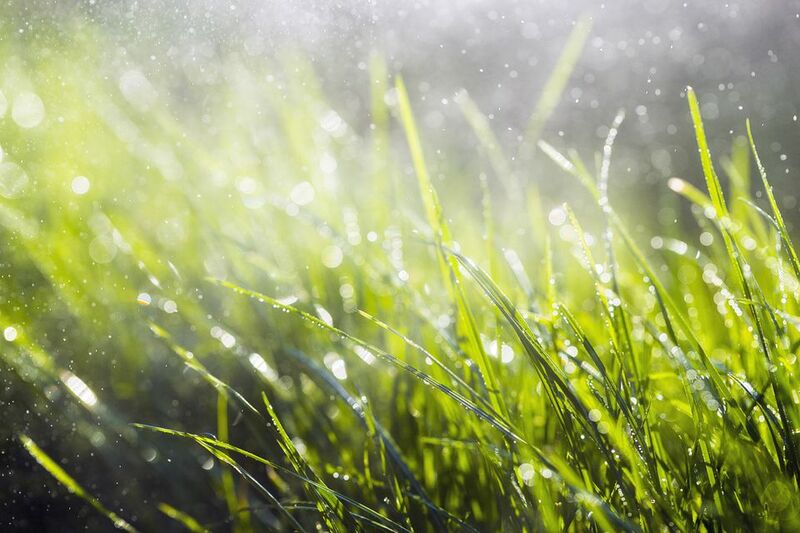 Lighter rains are enough to create conditions less than ideal for cutting lawns. And while early-morning mowing may be a great fit for your schedule, the dew on the lawn is enough to make it a big mistake for your landscaping. For an ideal cut, grass blades should be standing up off the ground. Wet blades of grass are heavier than dry ones. For this reason, such blades hug the ground. As your turf starts to dry after a rain, some of the blades will, indeed, resume their upright position and be chopped off when you mow. But the rest will not be standing at attention, and your mower will pass right over them rather than cutting them. When they do pop back up, your lawn will be riddled with "cowlicks." The resulting uneven look would be bad enough, but when you try to cut damp grass, the result is a tear rather than a clean cut. Such tears open the door for fungus. Moisture provides a medium for fungus to spread. So when you mow a lawn that's wet, you're creating a perfect storm for fungal infestations. Fungal diseases can also develop on a lawn that has been cut after a rainstorm through the grass clippings, which form bigger clumps under such conditions. These clippings mat down, restricting healthy airflow. An excess of grass clippings that fall on your lawn can lead to a fungal disease known as "brown spot." Meanwhile, the wet grass clippings that stick to the underside of the mower deck—if allowed to remain there—invite mold, which can then be spread to your turf. Finally, even the simple act of making passes up and down a wet lawn with your machine can hurt your lawn. The wheels sink down into a moist surface in a way that they won't when the ground is dry. At worst, the wheels will form ruts in the surface, directly damaging the grass. At best, they will cause the soil to become compacted, which causes damage over time. Moisture is problematic for the gasoline in the mower's fuel tank, its metal parts, and, indirectly, its engine. If you don't mix a stabilizer into the fuel tank, intruding moisture causes corrosion. Moist grass clippings that cake on the metal underside could eventually cause rust. Even in the short term, the presence of this caked substance causes the engine to work harder: It impedes the motion of the blade, and your engine works harder to make up for it. One way to eliminate the latter is to grow ground covers on slopes instead of grass. Regardless of the terrain and the type of mower you use, there's some danger of slipping on slick turf. It could easily cause you to pull a muscle, but even breaking a bone isn't out of the question. The worst possible scenario is that, in losing control of your body in the slippery conditions, one of your limbs falls into the path of the rotating blade. It takes more time and effort to mow a wet lawn. And because your lawn still won't look very good afterward, you'll want to mow all over again as soon as possible. Plus wet grass stains your clothes, shoes, and every surface your shoes touch. So cleaning up afterward is worse. But all of this is just the beginning of the added work, which comes mainly in the form of all the adjustments you'll have to make (compared to normal mowing). There has been an extended period of rain in your area, with even more rain forecasted, and you know waiting longer to mow would mean the grass would get much taller than it's supposed to. You have put your property on the real-estate market and are showing it today, and your yard has to be at its aesthetic best. Add stabilizer to your gasoline. Safely sharpen your mower blade. Raise your mower wheels; mowing higher than normal will put less stress on the engine. Don't try mulching or bagging the grass (with a wet lawn, mulching doesn't work as well, and the inside of your bag would get terribly dirty): Just discharge it out the side chute. On each pass you make while mowing, cut only half the swath you normally would. This way, the engine doesn't have to work as hard. Safely clean the underside of the mower's deck and the discharge chute as you go, so that fewer clippings cake onto them (spraying silicone onto a clean deck beforehand may make the scraping go easier). Rake up those clippings afterward and move them to your compost bin. You can also take a proactive approach. Listen to weather forecasts to stay informed about approaching rainstorms. When you know one is coming, mow your grass before it can get wet even if it wouldn't normally be time to mow yet.